We have designed a day for you to spend in Provence to visit the most beautiful monuments and villages. 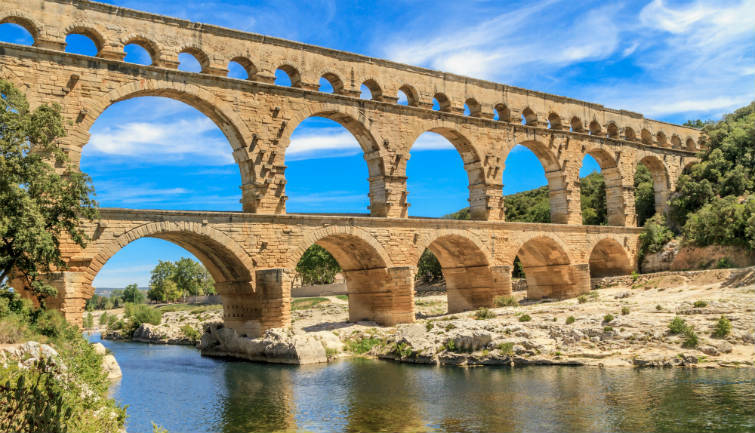 Discover the Pont du Gard, the best preserved Roman aqueduct dating back the 1st century AD standing in a protected and wild landscape. Stroll in the narrow cobbled stone streets in the medieval village of Les Baux de Provence, majestically built on a rocky spur in the Alpilles. The village has kept its traditional layout and is the perfect example of a French medieval fortress. You will then continue to the village of Saint-Rémy de Provence : a photo stop at the Roman monuments called « The Antiques » will be organized (Roman Triumphal Arch and Mausoleum). Travel through picturesque roads in the Luberon countryside and enjoy the colourful village of Roussillon famous for its red and yellow ochre cliffs. Climb up through the village to the panoramic point of view and discover and wonderful landscape. A stone's throw from there, you will see Gordes which ranks among the most beautiful villages in France. Gordes is a tiny little village entirely made of local dry-stone called Lauze. Free time to discover its narrow and steep Calade streets and maybe, have a sit and get a drink at a terrace to enjoy the so-provencal atmosphere. In Fontaine de Vaucluse, walk up to the cave from which the river Sorgue emerges. This impressive resurgence spring hasn't revealed its secrets yet and many speleologists have searched in vain the exact depth of the well. On Sundays only, the tour will lead you to the village of L'Isle sur la Sorgue also called the "Venice from Provence" : enjoy its traditional open-air market offering a shimmering palette of fragrance and colours. Depending on the day, you may visit the Provençal market in Gordes on Tuesdays, in Roussillon on Thursdays and in L'Isle sur la Sorgue on Sundays. The order of visits will then change accordingly. Free time for lunch on your own during the day. Excellent tour guide, wonderful sites.